Translation is replacing from source language (SL) to target language (TL) with equivalent meaning (semantic structure) which proper, appropriate and it is acceptable in target language based on closely equivalent involve meaning and style. The result of translation is difficult to receive 100 percent of Target Reader, because there are different meaning and style in both language concept, therefore the main point of translation is find the closely equivalent and style of language itself. The activities to produce of translation, we learn and practice how to translate particular language which appropriate. 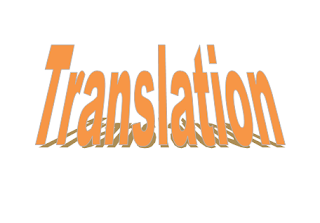 Product of translation is the result of translation itself, such as book, magazine etc. The definition of translation is such we explained above, it is not only in written form, but all kind of text, text is not always in written, all kind of language that has function is known as text, therefore it is written and spoken, but in small definition text is in written. Translation in written (translation), in written always refer to translation. Interpreting in spoken (interpreting), in interpreting just in spoken text. 0 Response to "Definition of Translation"